Andrea Magni from Italy has a blog post up with a new component called TDataSetRESTRequestAdapter for Delphi XE6 Firemonkey (and probably XE5 and AppMethod). What this component does is take a TDataSet and serialize it into JSON for uploading it via the TRESTRequest component. Currently, Firemonkey ships with a TRESTResponseDataSetAdapter which takes JSON from a server and puts it into a TDataSet. An example dataset component that you can use is TFDMemTable. This new component from Andrea completes the loop and allows you to make a round trip with your data. I’ve actually been thinking about a function for serializing a SQLite client side database after building various JSON deserialization and serialization functions but I think this new TDataSetRESTRequestAdapter may take care of that problem for me. The blog post is in Italian so use Chrome and translate it if needed. The component is free and available on Github. The component should work on Android, IOS, Windows, and OSX just like the other REST components. It also includes a demo project which shows how to use it. 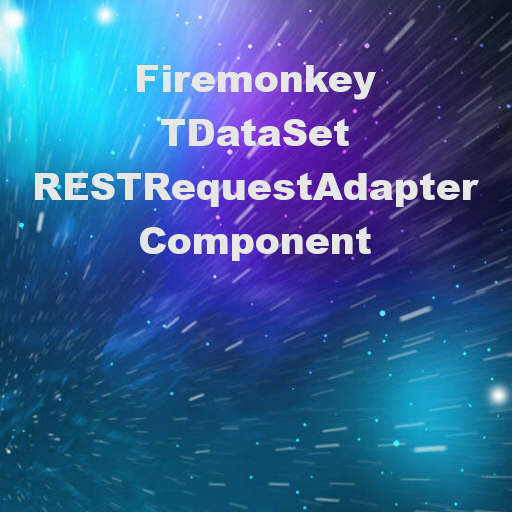 Head over and check out the full blog post explaining TDataSetRESTRequestAdapter for Firemonkey. Or head over to GitHub directory and download the full source code for the TDataSetRESTRequestAdapter for Delphi XE6 Firemonkey.